In my opinion, it's never to early to get the Christmas decorations out. Along with Thanksgiving, it's my absolute favorite time of the year. 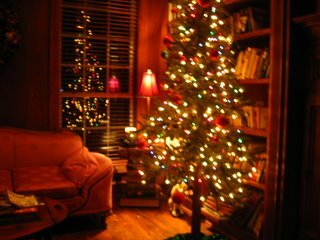 The picture above is one of many Christmas trees we have up in the house each year. This tree is located in my office. We actually have a storage room in the house just for Christmas trees! And while taking them down is a bit of a bummer, it's worth it. One year we put off taking them down until Valentines Day!